Trash receptaclesand recycling receptacles provide a solution for waste disposal. All too often, waste receptacles are poorly located, are in poor condition, or are simply not appealing enough for people to use. Sometimes, building managers place sub-standard receptacles in low visibility areas because they are unsightly. The result could be a dirty building. The New Yorker Collection: Designer Waste Receptacles by Glaro Inc. In commercial, public, and institutional facilities, entrance areas, lobbies, and other common areas, indoors or outdoors, waste receptacles and recycling receptacles need to meet a specific aesthetic standard. Decorative trash receptacles are essential functional amenities needed to complete a space. Designer waste receptacles and recycling receptacles can transform a bland, monotone location into an interesting one with accents, personality, and consistency that provide for good housekeeping and environmental compliance. From our experience, decorative waste receptacles, also known as decorative trash receptacles, have many advantages. They should be robust, well- built metal waste receptacles with a visual appeal based in both the materials used as well as how the receptacles are finished and presented. They also provide practical advantages including improved durability, fire safety, design flexibility, and easy maintenance. • Two metal finishes and 29 powder coat finishes allow buyers to create their own color combinations on each unit. Covers and bodies may match or contrast. • Glaro low maintenance finishes do not require polishing or frequent cleaning. Polished brass, mirror chrome, and stainless steel do. • Silk screened messages and customized logos are easily added to Glaro designer waste receptacles. • You will have the confidence that your designer waste receptacles or recycling receptacles will also match the palette of other Glaro products used in the same facility, such as bellman carts, platform trucks, cigarette ashtrays, receptacles, planters, crowd control equipment, umbrella stands and signage displays. • The carefully developed finishes of Gloss Brass and Gloss Chrome powder coated baked finishes are maintenance free but simulate high maintenance expensive finishes like authentic mirror brass and mirror chrome. The advantages of designer waste receptacles also apply to all recycling receptacles. 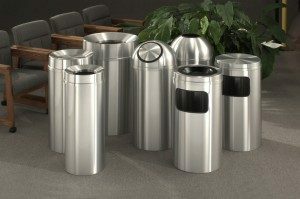 If you are interested in more information on designer trash receptacles or designer recycling receptacles, visit our corporate website at www.glaro.com.